"I am offering my obeisance to Sri Krishna Das Prabhu, whose form is very beautiful and auspicious, who always smiles and has a very melodious voice; who day and night chants the Holy Name in a very beautiful way, bringing about the nectar of Lord Krishna; who resides in Vraja during the pastimes of Lord Krishna and in Mayapur during the pastimes of Gaura; and who sports in devotion with proper renunciation." 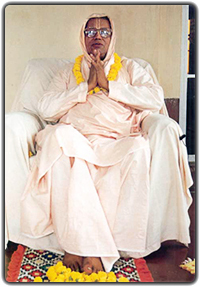 "Srila Krishna Das Babaji Maharaj was a good kirtaniya and a good singer, and that Krishna Das Babaji Maharaj would walk from Nabadwip to Hapaniya and chant Srila Sridhar Maharaj's song..."
"'Time has passed as I have been busy in my material life, and I have got nothing—only became burdened. What sort of world is this?' In this world there is no want of food, no want of money, no want of anything except only one thing..."
His Divine Grace Om Vishnupad Srila Bhakti Nirmal Acharya Maharaj pays a brief visit to Sri Nrisingha Palli temple of Sri Chaitanya Saraswat Math to check on the rapid construction of the living quarters atop the nat mandir. This weekend, to the great joy of the all the devotees, His Divine Grace attends a grand festival in Mejhiari, a small town in the area of Katwa and to the east of Nabadwip. Sharing photographs from the adhivas (eve) of the festival. The festival in Majhiari culminates with the installation of Sri Sri Gaura Nityananda Prabhu's Deities: "Every day Nitai Gaura personally take service from you all. How fortunate you are! Gaura Nitai appeared in Mayapur and Ekachakra, but They have come here to take service from you." For the pleasure of Sri Gurupadpadma, devotees arrange a grand Vaishnav seva at the end of the programme including the Lordships' abhisekh, His Divine Grace's exclusive Hari-katha and arati. Completing the grand festival at Sri Chaitanya Saraswat Math, Tarakeshwar, His Divine Grace Om Vishnupad Srila Bhakti Nirmal Acharya Maharaj continues his non-stop preaching programme and travels to Singur, a small town in Hooghly district to speak at a well-attended programme organised by the local devotees. Tue, 16 April 2019: (Today is Sri Kamada Ekadashi, tomorrow paran is at 5:20-9:31 a.m.
"In the company of loving devotees, I behold all the places my Gaurasundar roamed during His ecstatic Pastimes." We are offering obeisance at your holy feet and extending this Letter of Invitation. 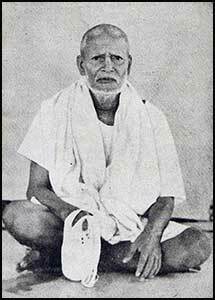 It was in late 1950s that His Divine Grace Om Vishnupad Srila Bhakti Sundar Govinda Dev-Goswami Maharaj started pilgrimage tours to South India, for the service and pleasure of His Divine Grace Om Vishnupad Srila Bhakti Raksak Sridhar Dev-Goswami Maharaj. Following the footsteps of Sri Gurupadpadma, His Divine Grace Om Vishnupad Srila Bhakti Nirmal Acharya Maharaj, the current Successor President and Sevaite Acharya of Sri Chaitanya Saraswat Math, is organising an extensive two weeks' tour of South India that shall include Sri Puri Dham Ratha-yatra annual pilgrimage. The dates of the tour are from 29 June 2019 to 13 July 2019. It is His Divine Grace's earnest and express desire that anyone wishing to join this Parikrama is most welcome to come. 29 June (Sat) — train Kolkata (Howrah)-Puri. 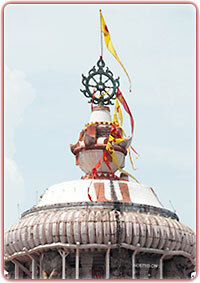 30 June (Sun)–3 July (Wed) — parikrama of the holy places in Sri Puri Dham. 4 July (Thu) — the grand chariot festival of Lord Jagannath, Baladev, Subhadra Mayi. Kurmaksetra, Srikakulam, Simhachalam, Kovvur (Godavari), Vijayawada (Pana Nrisinghadev and Laksmi Nrisinghadev temples), Srisailam, Ahobilam (Temple of Nava-Nrisingha), Tirupati. 12 July (Fri) — train Tirupati-Kolkata (devotees can also take a return flight from Tirupati). Those who wish to join the holy Parikrama are humbly requested to get in touch with us via any of the email addresses below. The total cost to be contributed towards the tour is $260, which includes all travel and accommodation expenses during the tour. We pray that you find an opportunity to bless us with your association for the entire tour or any part of it. 5) Interpret the Name with the help of a dictionary, etc. 6) Consider the Name imaginary. 7) Sin and chant to remove the sin. 8) Consider chanting equal to pious activities. 9) Instruct faithless people in chanting, inattentive chanting. 10) Remain attached to things, your body, etc.